What should I know about medical abbreviations? What do they mean? Have you ever wondered why you can't read the doctor's note or the letters and numbers on a prescription? Health care professionals often quickly scribble notes with important medical information that they would like a patient to reference in regard to the type of current, or recently diagnosed disease, syndrome, or other health condition(s). Have you ever see the doctor's notes in your medical record and found peculiar abbreviations and jargon? Do you wonder what the letters and numbers mean on your prescriptions or other items related to a disease, syndrome, or disorder? Doctors and other health care professionals commonly use a list of abbreviations, acronyms, and other medical terminology as a reference to rapidly search and accurately record information about, and give instructions to their patients. There is no standard or approved list used by health care professionals to search for medical acronyms or abbreviations. Therefore, it is important to understand the context in which the abbreviation or term has been used. Abbreviations, acronyms, and medical terminology are used for many conditions, and for instructions on medication prescribed by your doctor. This is a short list of common abbreviations you may have seen on a doctor's notepad; a prescription drug package or bottle; lab or other test results; or in your doctor's notes. FSH: Follicle stimulating hormone. A blood test for follicle stimulating hormone which is used to evaluate fertility in women. HPS: Hantavirus pulmonary syndrome. A type of contagious, infectious disease transmitted by rats infected with the virus. IDDM: Insulin-dependent diabetes mellitus. Type 1 diabetes. PE: Pulmonary embolism. A type of blood clot in the lungs. TSH: Thyroid stimulating hormone. 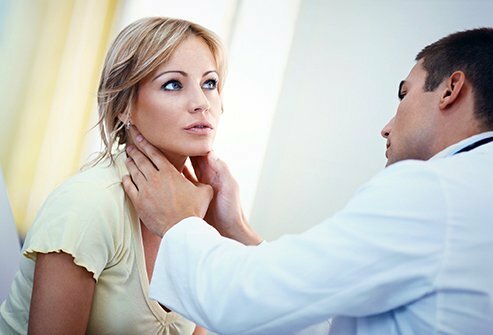 A blood test for TSH is used to diagnose thyroid disease. Use this list as a resource for common abbreviations and acronyms used in the health care community, to quickly search and answer your questions about those letters and numbers of a drug your doctor has prescribed to you, or other notes from your doctor or other medical professionals. Ad lib: At liberty. For example, a patient may be permitted to move out of bed freely and orders would, therefore, be for activities to be ad lib. ASCVD: Atherosclerotic cardiovascular disease. A form of heart disease. bld: Blood. Blood was visible on the patient’s scalp. Bandemia: Slang for elevated level of band forms of white blood cells. Bibasilar: At the bases of both lungs. For example, someone with a pneumonia in both lungs might have abnormal bibasilar breath sounds. BMP: Basic metabolic panel. Electrolytes (potassium, sodium, carbon dioxide, and chloride) and creatinine and glucose. BPD: Borderline personality disorder. A personality disorder. BSO: Bilateral salpingo-oophorectomy. A BSO is the removal of both of the ovaries and adjacent Fallopian tubes and often is performed as part of a total abdominal hysterectomy. Ca: Cancer; carcinoma. For example, a patient who undergoing treatment for cancer should assure that they are eating and drinking enough fluids daily, both during and after treatment. CABG. Coronary artery bypass graft. A surgery involving the heart. CC: Chief complaint. The patient's main concern. CDE: Complete dental (oral) evaluation. cc: Cubic centimeters. For example, the amount of fluid removed from the body is recorded in ccs. Chem panel: Chemistry panel. A comprehensive screening blood test that indicates the status of the liver, kidneys, and electrolytes. CT: Chemotherapy. A type of treatment therapy for cancer. D/C or DC: Discontinue or discharge. For example, a doctor will D/C a drug. Alternatively, the doctor might DC a patient from the hospital. DCIS: Ductal Carcinoma In Situ. A type of breast cancer. The patient is receiving treatment for Ductal Carcinoma In Situ. DDX: Differential diagnosis. A variety diagnostic possibilities are being considered to diagnose the type of cancer present in the patient. DNC, D&C, or D and C: Dilation and curettage. Widening the cervix and scrapping with a curette for the purpose of removing tissue lining the inner surface of the womb (uterus). DNR: Do not resuscitate. This is a specific order not to revive a patient artificially if they succumb to illness. If a patient is given a DNR order, they are not resuscitated if they are near death and no code blue is called. DVT: Deep venous thrombosis (blood clot in large vein). ETOH: Alcohol. ETOH intake history is often recorded as part of a patient history. ECT: Electroconclusive therapy. A procedure used to control seizures (convulsions). g: gram, a unit of weight. The cream is available in both 30 and 60 gram tubes. GOMER: Slang for "get out of my emergency room." GvHD: Graft vs. host disease. It is complicated by the syndromes of acute and chronic graft-vs-host disease (GVHD). HRT: Hormone replacement or hormone replacement therapy. ICU: Intensive care unit. The patient was moved to the intensive care unit. IM: Intramuscular. This is a typical notation when noting or ordering an injection (shot) given into muscle, such as with B12 for pernicious anemia. IMP: Impression. This is the summary conclusion of the patient's condition by the healthcare professional at that particular date and time. IPF: Idiopathic pulmonary fibrosis. A type of lung disease. LCIS: Lobular Carcinoma In Situ. A type of cancer of the breast. The patient is receiving treatment for Lobular Carcinoma In Situ. LLQ: Left lower quadrant. Diverticulitis pain is often in the LLQ of the abdomen. LUQ: Left upper quadrant. The spleen is located in the LUQ of the abdomen. npo: Nothing by mouth. For example, if a patient was about to undergo a surgical operation requiring general anesthesia, they may be required to avoid food or beverage prior to the procedure. O&P: Ova and parasites. Stool O & P is tested in the laboratory to detect parasitic infection in persons with chronic diarrhea. ORIF: Open reduction and internal fixation, such as with the orthopedic repair of a hip fracture. P: Pulse. Pulse is recorded as part of the physical examination. It is one of the "vital signs." p¯: After meals. As in take two tablets after meals. p.r.n. : As needed. So that it is not always done, but done only when the situation calls for it (or example, taking a pain medication only when having pain and not without pain). PD: Progressive disease. Patients at risk of developing progressive disease of the kidneys include those with proteinuria or hematuria. PFT: Pulmonary function test. A test to evaluate the how well the lungs are functioning. PUD: Peptic ulcer disease. A type of ulcer of the stomach. q.d. : Each day. As in taking a medicine daily. RA: Rheumatoid arthritis. A type of joint disease. R/O: Rule out. Doctors frequently will rule out various possible diagnoses when figuring out the correct diagnosis. SAD: Season affective disorder. A type of depression that occurs during the winter months when there is little light. SQ: Subcutaneous. This is a typical notation when noting or ordering an injection (shot) given into the fatty tissue under the skin, such as with insulin for diabetes mellitus. t.i.d. : Three times daily. As in taking a medicine three times daily. TAH: Total abdominal hysterectomy. A type of surgery to remove a woman’s uterus, Fallopian tubes, and ovaries. UA or u/a: Urinalysis. A UA is a typical part of a comprehensive physical examination. U or u**: Unit. Mistaken as the number 0 or 4, causing a 10-fold overdose or greater (for example, 4U seen as "40" or 4u seen as "44"); mistaken as "cc" so the dose is given in volume instead of units (for example, 4u seen as 4cc). XRT: Radiotherapy (external). A type of treatment that uses radiation. **These Medical Abbreviations are included on TJC's "minimum list" of dangerous Medical Abbreviations, acronyms and symbols that must be included on an organization's "Do Not Use" list, effective January 1, 2004. Visit www.jointcommission.org for more information about this TJC requirement. Cancerindex.org. "Medical Terminology for Cancer." Updated: Feb 01, 2014. Centers for Medicare & Medicaid Services. "Acronym List." ConsumerMedSafety.org. "Unsafe Medical Abbreviations." 2015. Columbia University. "Pediatric Dentistry Approved Abbreviations." Flanders University; School of Nursing and Midwifery. "Clinical communication." Pidala, J., et al. "Graft-vs-host disease following allogeneic hematopoietic cell transplantation." Cancer Control. 2011 Oct;18(4):268-76.